Nearly one in four Americans suffers from varicose veins. If you are experiencing the pain and discomfort of varicose veins, make an appointment with vascular surgeon Stephen M. Barnett, MD, at Vein Therapy of Atlanta. Dr. Barnett has extensive experience using the ClosureFast™ procedure to treat varicose veins and other vein problems. Call today to make an appointment. ClosureFast™ Targeted Endovenous Therapy, also known as the VNUS Closure procedure, is a minimally invasive treatment that uses radiofrequency energy to treat varicose veins. Because the ClosureFast™procedure is a nonsurgical treatment, recovery time is shorter and potential side effects are minimal compared to vein stripping procedures or laser vein ablation. How does the ClosureFast™ procedure work? The ClosureFast™procedure is performed in our office. 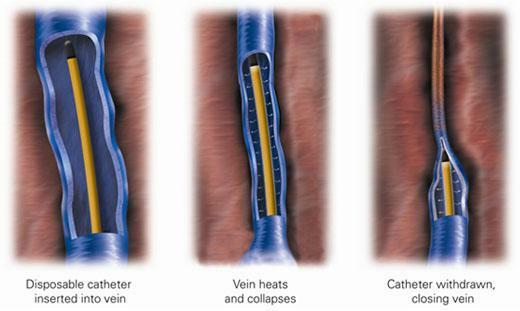 It utilizes a small catheter which delivers thermal (heat) energy to shrink the treated vein and to seal it closed. Local anesthetic is administered to eliminate discomfort and provide insulation to protect the surrounding tissues during treatment. No other anesthetic or sedation is needed. With ultrasound guidance, Dr. Barnett withdraws the catheter, treating your affected vein segment by segment, until the entire length of the vein has been closed. Soon the vein seals shut, forcing the blood to reroute to healthy veins. No fasting prior to your procedure is needed and you can continue taking your daily medications. What are the benefits of the ClosureFast™ procedure? What can I expect after a ClosureFast™ treatment? The ClosureFast™ procedure is an in-office treatment that lasts approximately one to two hours. Following the procedure, we strongly encourage the use of a compression stocking and avoidance of strenuous exercise to promote the best outcome. You will also be able to drive yourself home after your procedure and may return to work the same day. If you’d like more information about the ClosureFast™ procedure, call today to book an appointment. Most insurance plans including the major health providers pay for the ClosureFast™ procedure in part or in full, depending on your benefits.